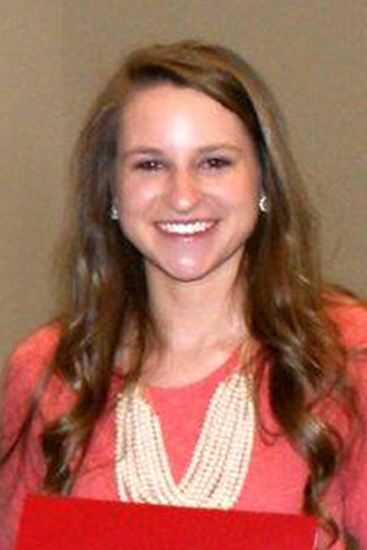 Aimee Dykes, a freshman pre-business major from Hixson, Tennessee, is Samford University’s 2015 Student Employee of the Year. Dykes, who works in Samford’s Office of Alumni Programs and Annual Giving, was honored at a ceremony on Thursday, April 23. She received a $200 cash award presented by Samford Human Resources director Fred Rogan. As the main contributor to the alumni office’s social media accounts, Dykes communicates daily to more than 3,000 alumni through Twitter, Instagram and Facebook pages. Her nominator for the award, assistant director of alumni programs Elizabeth Gettys, applauded Dykes’ reliability, work quality, initiative, professionalism and unique contributions. The honoree manages the responsibilities given to her, and is always willing to take on new tasks, said Gettys. Even during busy times for students, such as before a school break or final exams, “Aimee is still able to meet and exceed expectations,” Gettys said. Dykes, daughter of Tracey Dykes, is a graduate of Soddy Daisy High School. She will now compete for regional and possibly national honors in a program administered by the National Student Employment Association. About 900 Samford student employees work in a variety of ways and areas, according to Samford assistant director of payroll Janet Goodwin.